More good science communication like this show needed! 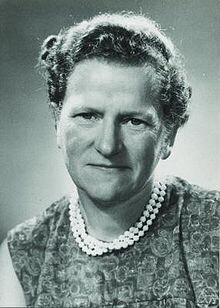 Hanna Neumann (1914-1971, born Johanna von Caemmerer) was a German-born UK and Australian group theorist. She was the first woman Chair of Pure Mathematics in Australia. She had a fascinaging life story. With her husband Bernhard Neumann, they had five children, four of whom became mathematicians. A new page on Facebook follows her story told in her own words, like a scrapbook of letters, documents and images – great use of facebook as a platform for telling oral history! if you are on Twitter, you can also follow this #NatSciWk, told in her own words (hashtags: #InHerOwnWords #AussieScientist). The project is created by Women in Science Australia, Australian National Centre for the Public Awareness of Science (CPAS), the NFSA, and The National Museum of Australia.